Sorry, wise care 365 doesn't have this option. we just want to notice user his/her browser is running now in case wise care 365 close your important page. You can try this, create a auto-clean task (on bottom left cornor), wise care 365 will skip browser if it is running. "You can try this, create a auto-clean task (on the bottom left corner), wise care 365 will skip browser if it is running." Where it says OFF (it's a button), then there's the alarm clock, then "Clean up your computer regularly". 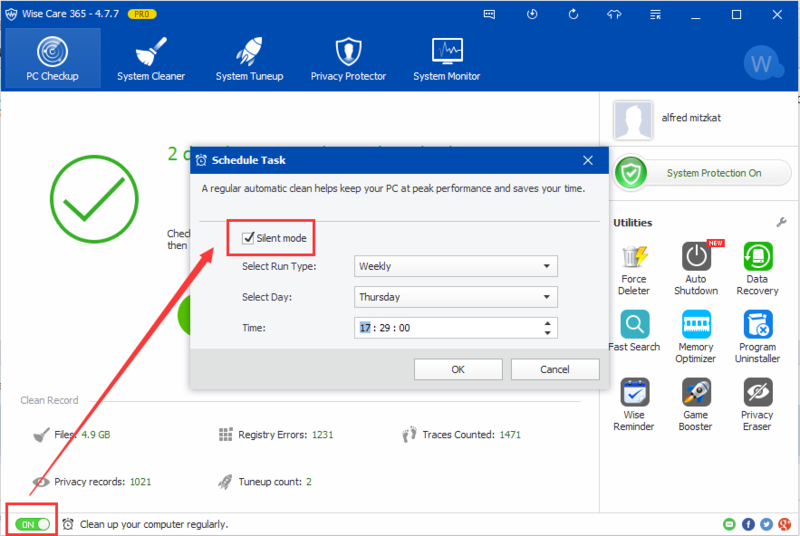 You can create a scheduled task from that interface, without having to create one directly from windows task scheduler.